Minnum from Jané is like an extra fashion accessory that provides the perfect companion on your strolls around the city so you can be as stylish as ever. The city won’t fit in with you, so you’ll have to fit in with it. Minnum from Jané has been designed right down to the last detail to give excellent manoeuvrability, which means you’ll be able to cope easily with whatever the city throws at you. Ultra light aluminium chassis, with dual action brakes, front and rear suspension and Pro-Fix system to attach the seat in the forward or rearward facing position and with the possibility of attaching all the Jané accessories. A new concept of pushchair for super-safe and easy handling in the city. 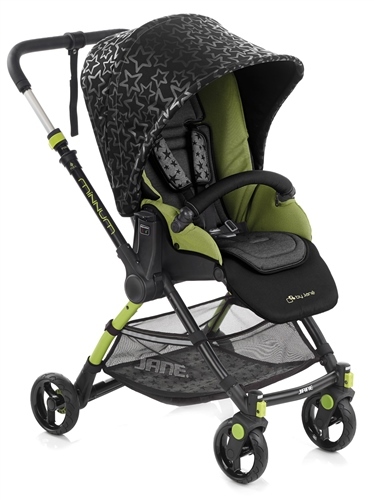 The Jané MINNUM pushchair / chassis has the Pro-fix system built-in, and the following infant car seats and carrycots are compatible to make the MINNUM into a travel system or pram.